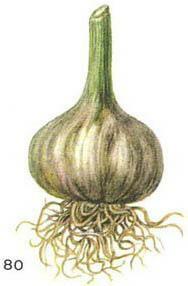 Garlic, onion-garlic (Allium sativum L.) - cultivated plant. The bulbs contain essential oil and volatile antibiotic alliin. Tincture bulbs (10-20 drops 2-3 times a day) is used as an antiseptic for suppressing putrefactive processes in the intestine, colitis, intestinal atony, as well as antihypertensive drugs for hypertension, atherosclerosis. Alcohol extract of bulbs (allisat) appoint 15 drops 3 times a day. Contraindicated in diseases of the kidney. Garlic is rich in selenium, besides, it contains many other important components, such as protein (5,6 %), carbohydrates and various minerals (including calcium, phosphorus, iron, magnesium). There are many vitamins of group b, vitamin C, various Sugars, still it is famous for well familiar to all of smell, the source of which is glucoside push. Allin under the action of the enzyme allinase split into fructose and allicin - volatile compound of sulphur with a characteristic odor. For us the most important fact that this is a volatile compound kills bacteria. It is suggested that garlic has even connections hormonal action and of radioactive uranium. But this assumption. Precisely also known that there are volatile, he even considered the richest source. The phytoncides are not a medicine in the traditional sense of the word. Garlic, horseradish, and others, in which the most volatile, used in the canning and for pickling of vegetables. Hell, as established in Cracow hematological clinic, is a powerful tool, overwhelming the development of fungi and moulds (including producing toxins), which still has not paid adequate attention. About garlic say that it works as carbolic acid in the mouth"because kills all microorganisms and leaves a strong smell. In any case, it disinfects the digestive, respiratory system, treats chronic diarrhea, atherosclerosis, prevents the development of senile marasmus, atherosclerosis and heart attacks. Now about the heart. In the US, for example, of the three deaths one caused by heart disease, and in Spain from 17 - one. On 100 thousand population from heart disease die each year in the U.S. 319,5, in Italy - 208,9, in Spain - 71,3 person. The Americans warn their tourists traveling to Spain that the country this smelled of garlic. They even maliciously notice that the "toreador can kill a bull with his breath," because before the fight he traditionally eats especially a lot of garlic. Spanish garlic - very tasty, each slice it the size of a head of our ordinary garlic, and eat it there all and everywhere. Faith in what he gives strength, energy and courage, preserved in Spain, apparently, since ancient times. However, we cannot say with confidence that only garlic is the reason for the relatively rare cases of death from heart disease in Spain, as in this country is used in food, in addition, solely sea salt, rich in minerals, and, hence, selenium, and magnesium. But many scientists from different countries is conditioned by the main credit goes to garlic. And the Italians are less than the British or Americans die of heart disease, they also love and eat a lot of garlic, though less than half the Spaniards. Garlic is useful not only for the prevention of heart disease. As onions, eaten with meat garlic mitigating the harmful effects of saturated fats, excess cholesteroland prevents the formation of blood clots. Indian doctors say that it acts as anti-inflammatory means, as cleanses the blood of excess glucose. The residents of Ethiopia is the highest level of cholesterol in blood, but there has been very few cases of the disease atherosclerosis. Maybe because eating garlic willingly, often and much. Aliens in Spain often fall ill with dysentery. And in Mexico, too. Everyone who suffers from stomach diseases, recommended daily to drink the "footprint" of garlic juice. Dr. Markovic from Italy after 25 years of research and observation concluded that garlic effectively treat diarrheacaused by different types of bacteria, is a chronic and acute, and dysentery , and, as he claims, even cholera. During the second world war, when in Italy lacked medicines, he effectively treated with garlic almost all patients with diseases of the digestive tract. In one of the experiments he found that after the introduction of 10 times the lethal dose of dysentery toxin 2.5 g of dry garlic powder save rabbits from the disease. Even in ancient Babylon, Egypt, Greece, Rome, India, and China was eating garlic in diseases of the gastrointestinal tract and worms. In our time, albert Schweitzer gave him sick with typhus and cholera and got great results. In 1970 biologist Eldon L. rivers found that garlic stops the growth of cancer cells. This is confirmed by the classic studies on mice. Cancer patients animals were given the drug of garlic oil, and they lived significantly longer than mice that did not receive the garlic. Dr. F. G. Piotrovsky at the University of Geneva was treated with garlic 100 patients with hypertension in a different stage. 40% of them after 3-4 days experienced significant improvement: were headaches and dizziness, has disappeared difficulties in concentration, etc., and Another 40 % were improving, but not so significant. However, a different result, and was not expected, because, in addition to hypertension, patients suffered from kidney diseases, difficult to treat diet. Still, the improvement was. From hypertension die each year (per 100 thousand population): in the USA - 39,1, in Italy - 34,5, in Spain - 13,9 person. Nutritionists advise in the treatment of hypertension, except "piles" of garlic oil, drink a "pile" of vitamin E - gorgeous "elixir of youth"! We only wanted to draw attention to the natural compounds in garlic, and not to recommend any of hypertension treatment can only garlic without consultation with a physician. A complex of symptoms of hypertension of I-IV degree is caused by a number of reasons, and therefore the treatment it requires an individual approach. In the future the doctor will help in the computer, in the meantime, we have to be content with what you have.